For easy reference, I've popped a screenshot of 'Harry Potter and the Chamber of Secrets' below. There are changes to this screenshot that I made through creative judgement, so it's not going to be an exact replica. Hi everyone! 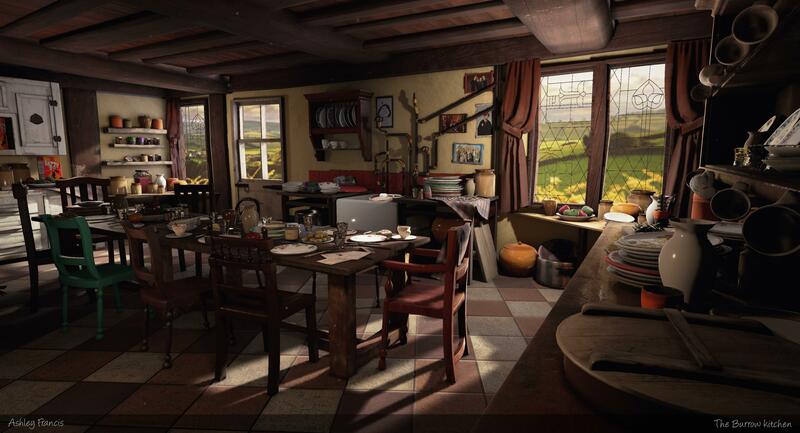 So for my final year project at Teesside University, I'm going to be doing a 3D environment of Mrs Weasley's Kitchen from Harry Potter. I'll be posting each step of the way, and hopefully be getting feedback from all you guys and also my tutors as I go along. 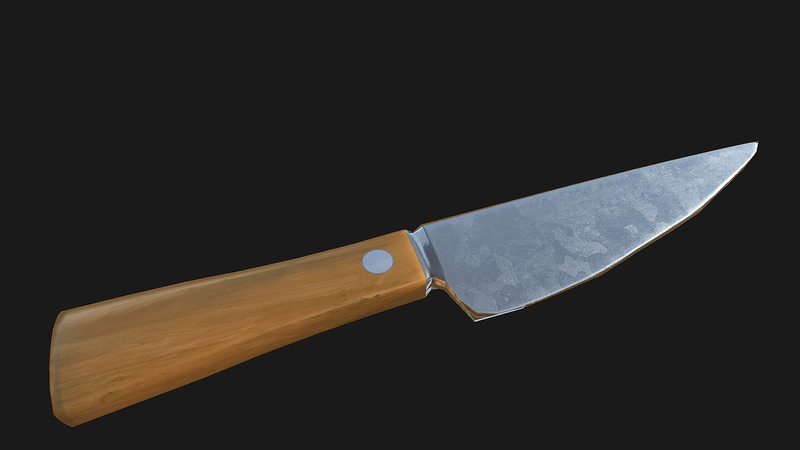 I'm aiming to do some high poly to low poly sculpts, trying out some PBR, realistic styles and rendering. Another Teessider! 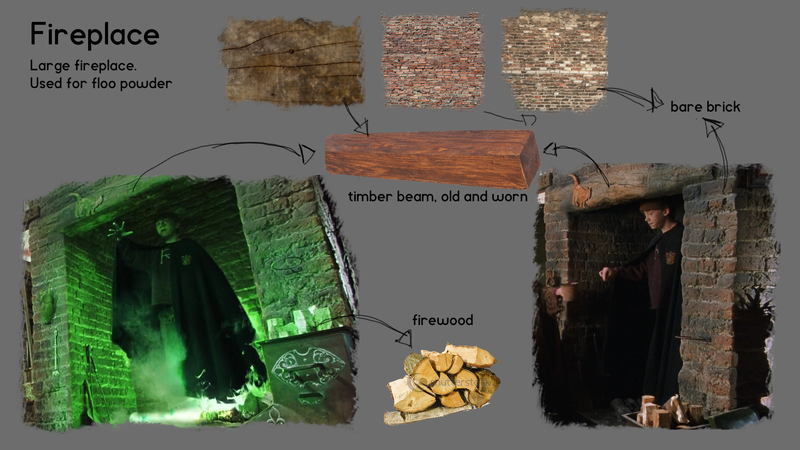 I was actually thinking of doing a scene from HP myself recently, haha, but show us some moodboards and blockouts! 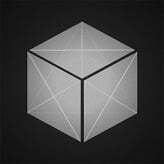 For this project, I will be using 3DS max to model the assets, and then Mudbox to create high poly sculpts. 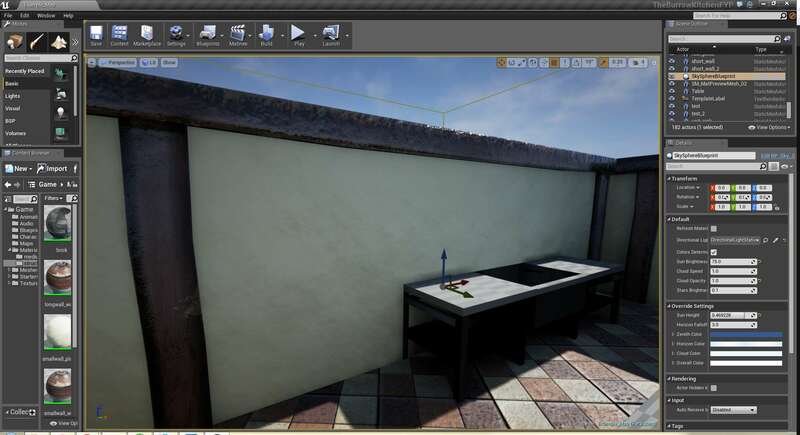 I will texture within Quixel, and export to Unreal Engine 4 to assemble the environment. The main film I will be looking at for reference is 'Harry Potter and The Chamber of Secrets' as that is its first appearance, and is warm and friendly. 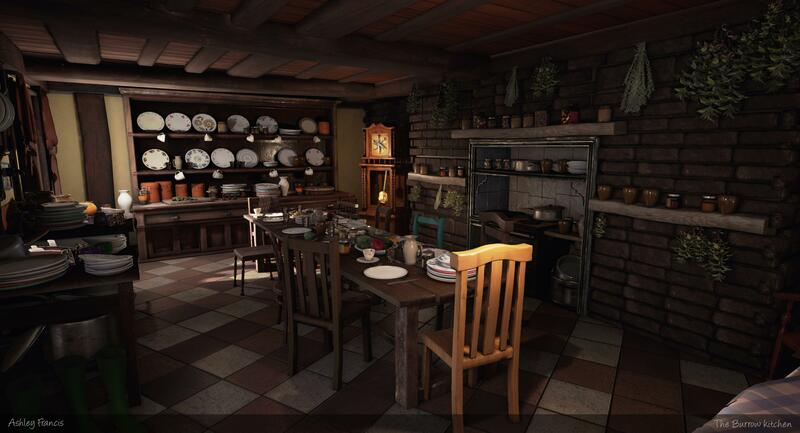 Later appearances of the kitchen has a darker tone and mood as the series 'grows up' and darkens. 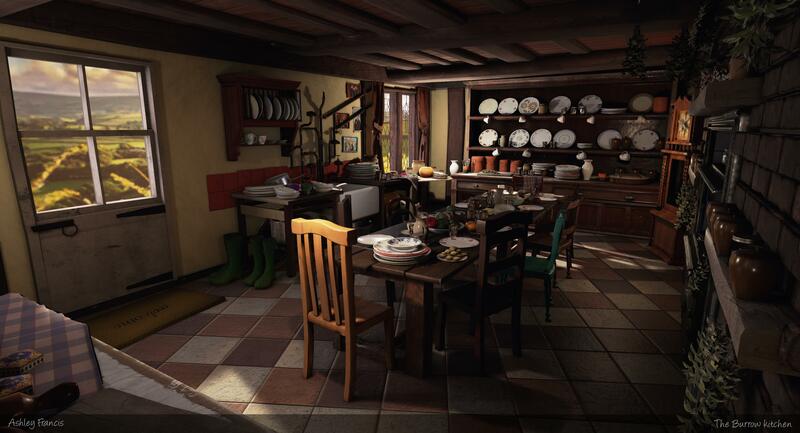 I will also use LEGO Harry Potter years 1-4 as an example, as the kitchen features within this game. 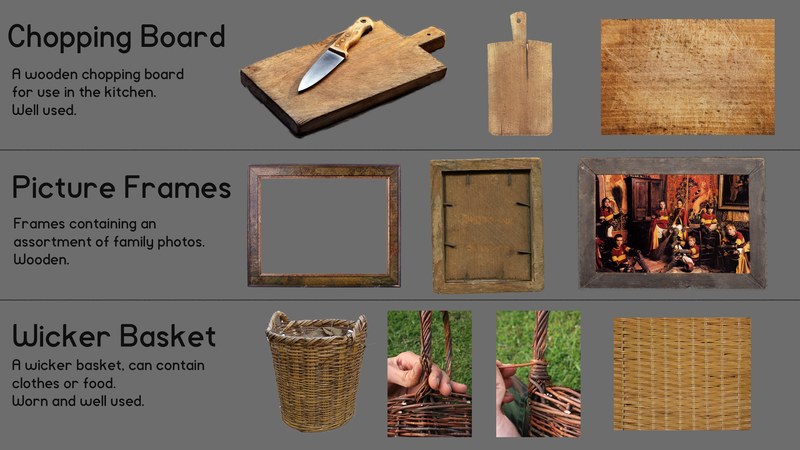 This initial moodboard was my starting point of my pre-production. 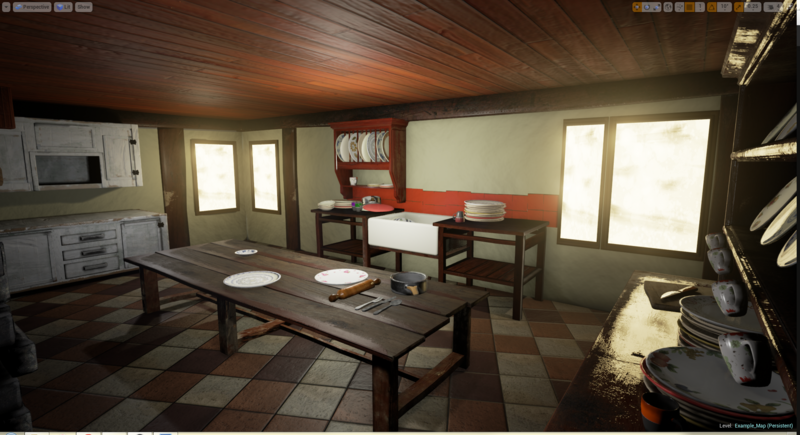 A medium sized room, densely packed with smaller assets and a achieveable amount of detailed assets. I feel this is achievable in a 20 week project. 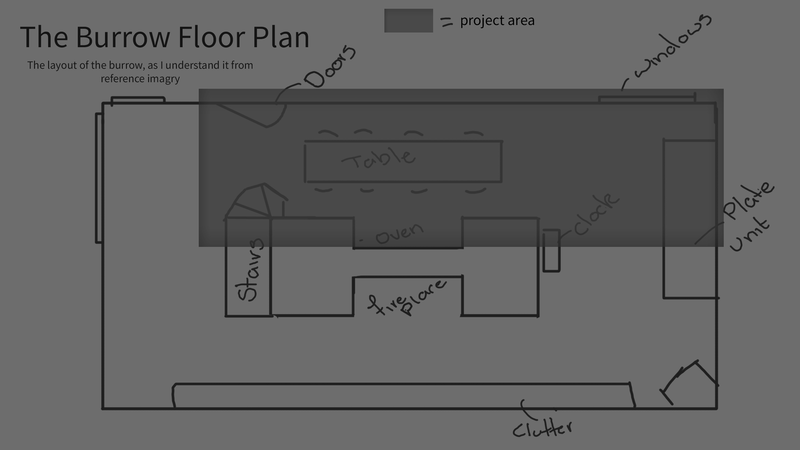 To decide my project area more thoroughly, I attempted to draw up a very quick floor plan of the entire burrow, some large assets are labeled so the viewer can get their bearing and orientation. 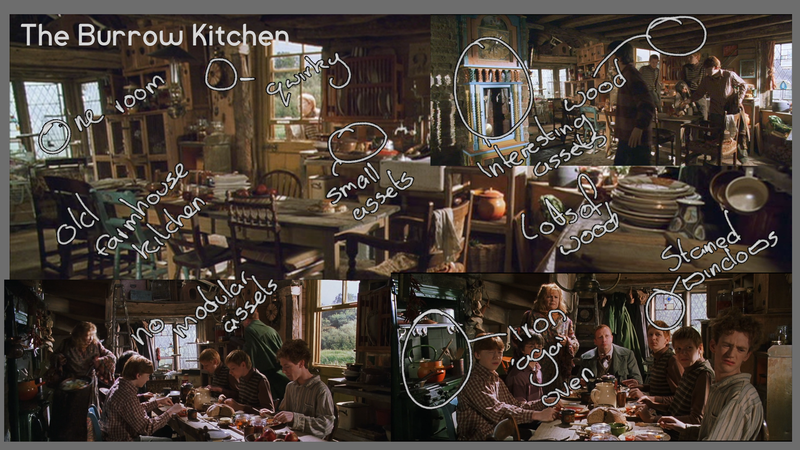 I came to this floorplan through looking through the kitchen section of the film repeatedly. The grey area signifies the refined project area I intend to create. From this, and a few other pieces of reference I am able to produce an initial asset list (currently at 40 unique assets) and a floor plan, which I've included below. 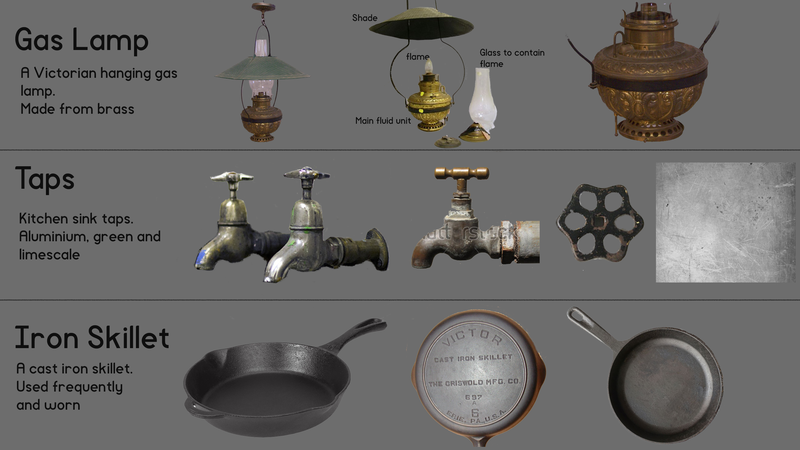 Once I had my asset list up and running, I started doing more detailed reference work in to each individual asset. The majority are below, more to come! To check I was able to create the assets to the quality I would like, I decided to do a pipeline test on an unrelated asset. 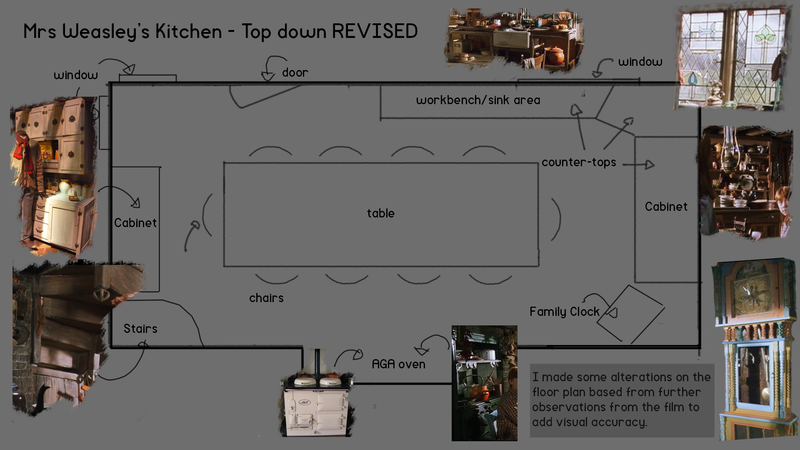 After consulting with my supervisor, I revised my intended floor plan of the kitchen to match more accurately with the film. I think this will make it much more recognisable in the long term. 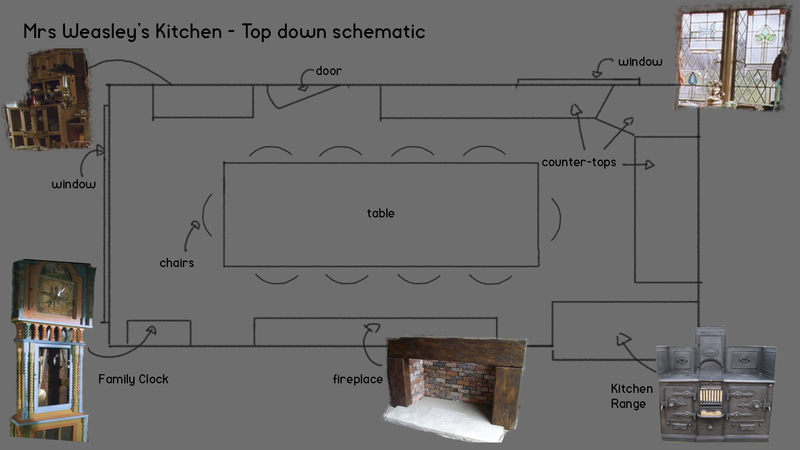 I will use this floor plan to create my blockout from. Started my blockout, I'm combining all my assets within 3DS max, and importing it to UE4 as one .fbx to test for scale and sizes. Fantastic breakdown and research! I'm looking forward to what's undoubtedly going to be further astonishment from this project. I wish i was that thorough with my project's pre-production. Great planning you've got there. Excellent pre-prod, much better than mine! I'm sure that'll really pay off later on in your project. I'm looking forward to seeing more too. 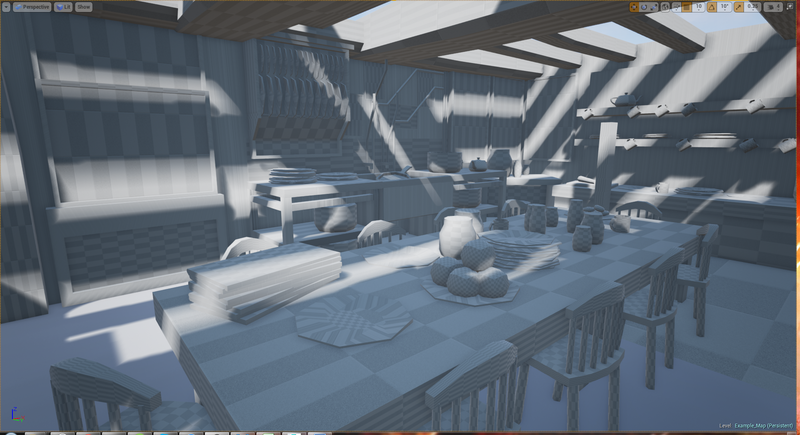 A little bit more work later, I have a pretty much finished blockout. 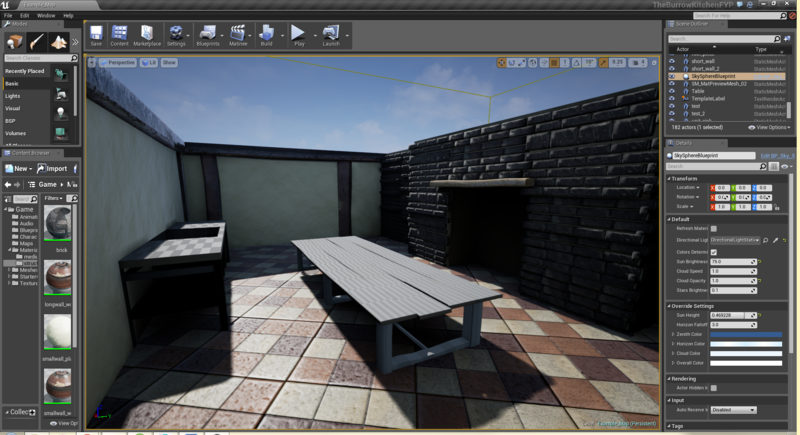 Looking about 60-70 assets in the scene, so plenty work to keep me busy here. 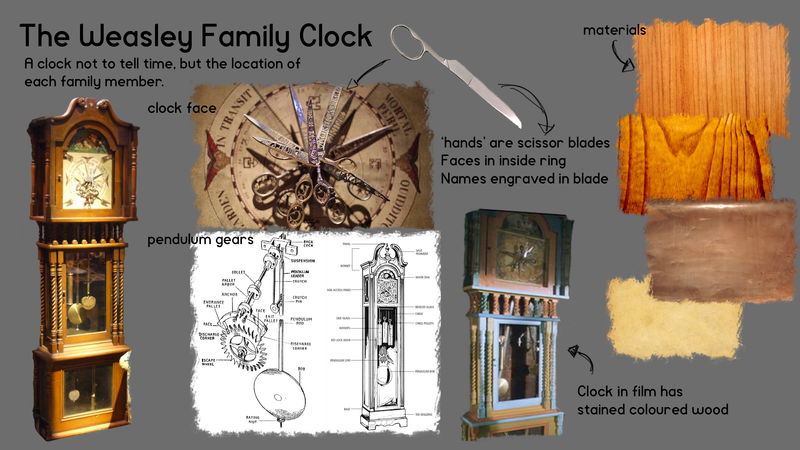 Production shall be starting in earnest next week so long as I've not missed anything in my pre-production. 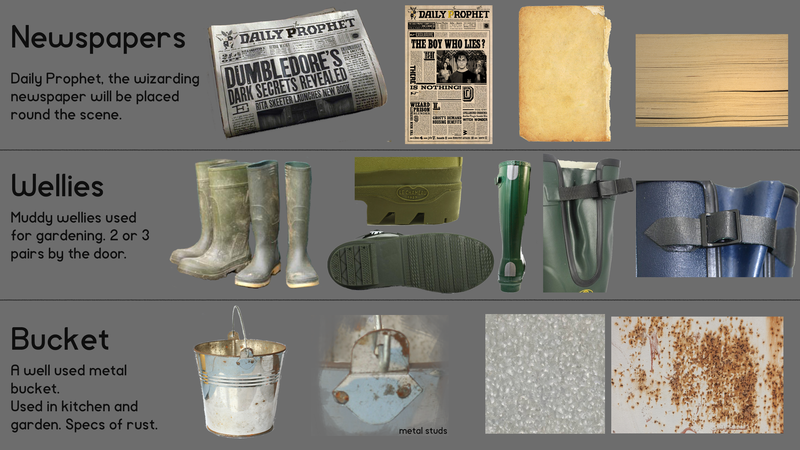 Such a good idea for a scene and I'm obsessed with the reference breakdowns of each asset. Great process! Thank you I always thoroughly enjoy pre-pro. Supervisor has approved it all, so this next week I shall be cracking out the walls and floors (everything structural) and a first pass on lighting. Got a little behind with other modules this week, so a smaller update for you all this week. 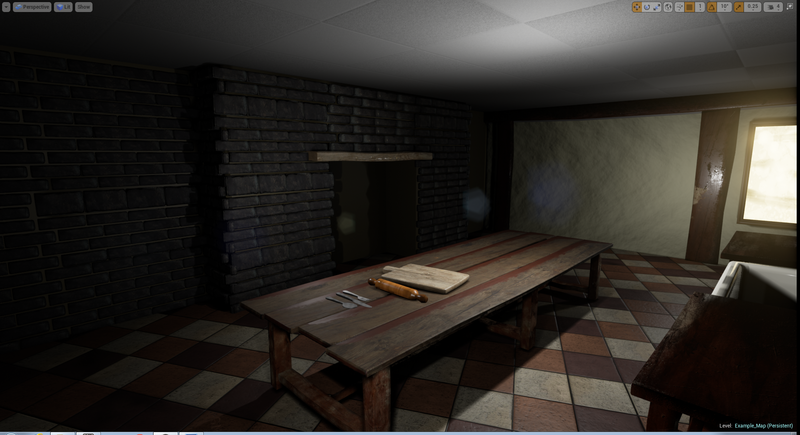 Got the floor material started, and basic lighting set up. and a better look at that material. Not too sure where the thicker black lines are coming from, will have to look in to it, its really bothering me. I'll add some dusty/dirty decals in the coming week, and get the rest of the structure sorted. As you point out yourself, those black lines are very distracting and bothering. Maybe better to replace them with a bit thicker mortar/clay look. 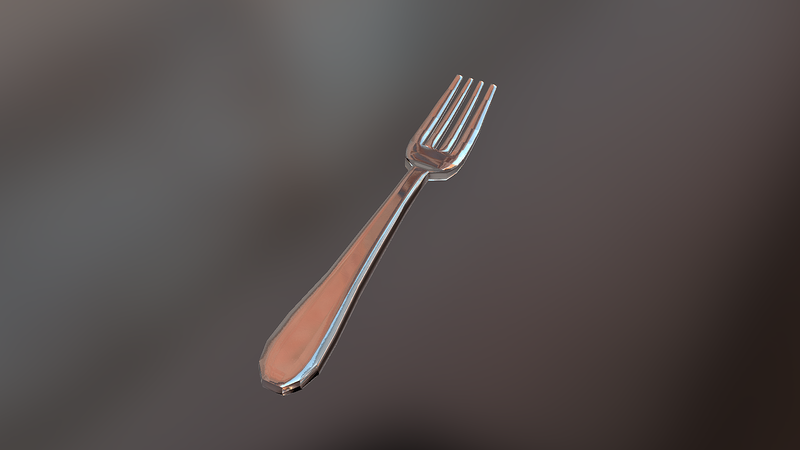 If you look at these, you'll also see how you might want to increase the smoothness values on them. Keep at it! It's gun' be good! @jussibrox - Thanks very much for the feedback! Currently the floor is all shader and normal maps on a flat plane. I 100% agree, need to mix up the shapes and levels to make it more visually interesting - looks super boring. I'm going to do some actual geometry over the next week to see what difference it makes. Like you said, different height ties and maybe some cracks in others. 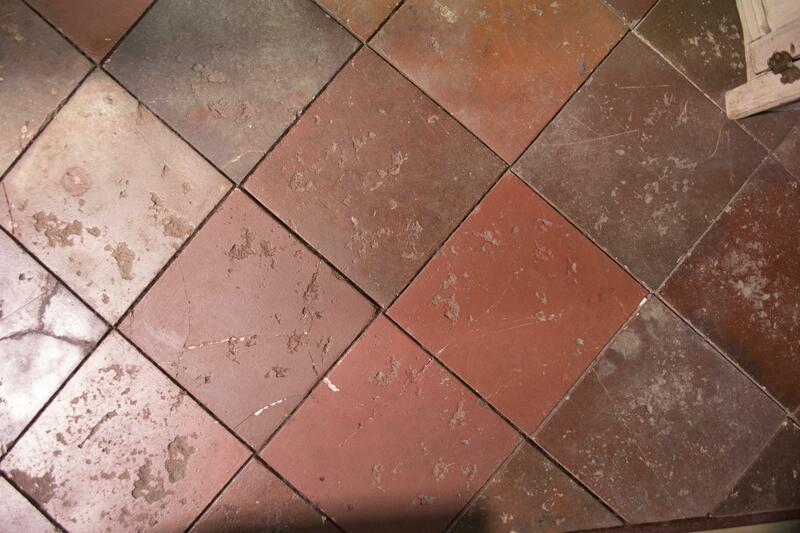 Will probably level out the colour difference between the tiles too, looks a tad too jarring to the eye. 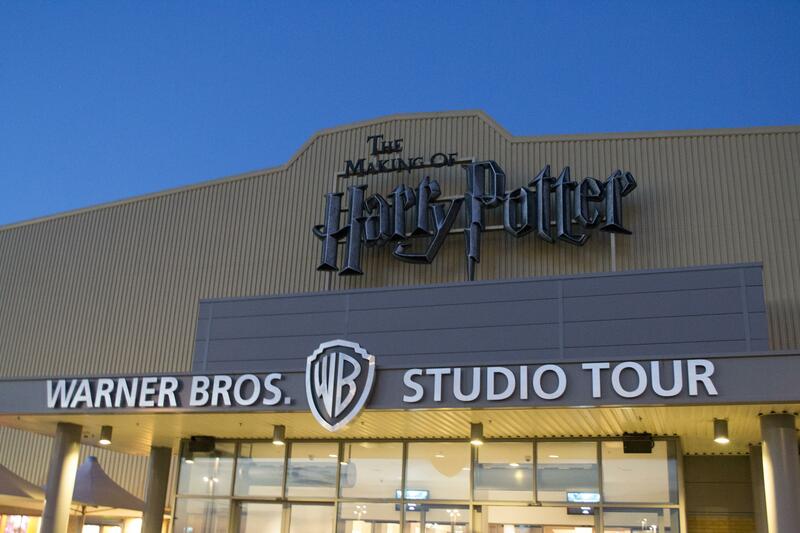 As for the outside areas, at first I'm going to try and replicate what they do at the Warner Brother's studio (which I'm visiting next week woooooo). As the set is inside, but still includes windows, they had to give that 'outside' feel, and I think they've done this through lightboxes, and a semi-transparent sticker. 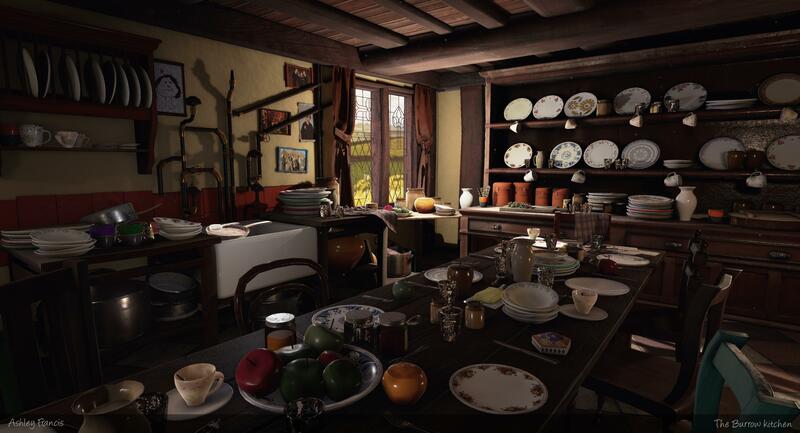 I can replicate this with emissive maps and some masking I think. Not strictly an update, but I'm still kinda buzzing from the trip, it was FAB. 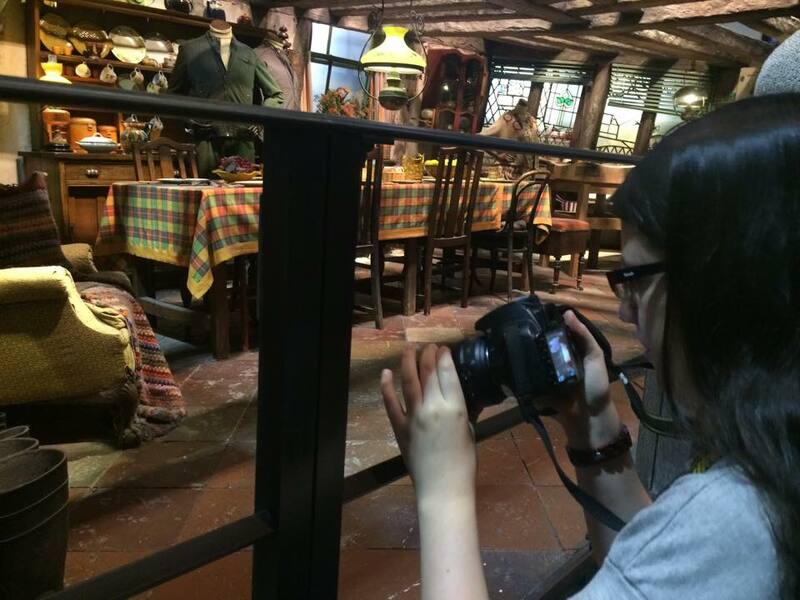 I went down to London (5 hours in a car woo) to go round the Warner Brothers Harry Potter studio tour, as this features The Burrow kitchen. 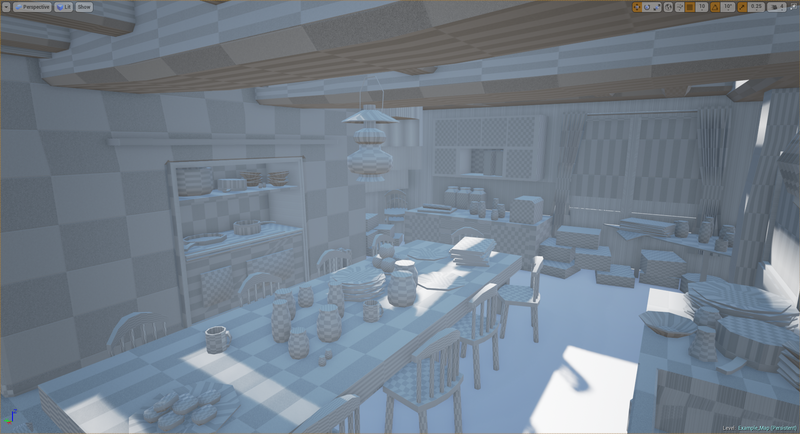 I got over 100 images of the kitchen, including some good texture sources to start with, close up details, and some clearer images on how the kitchen fits together. 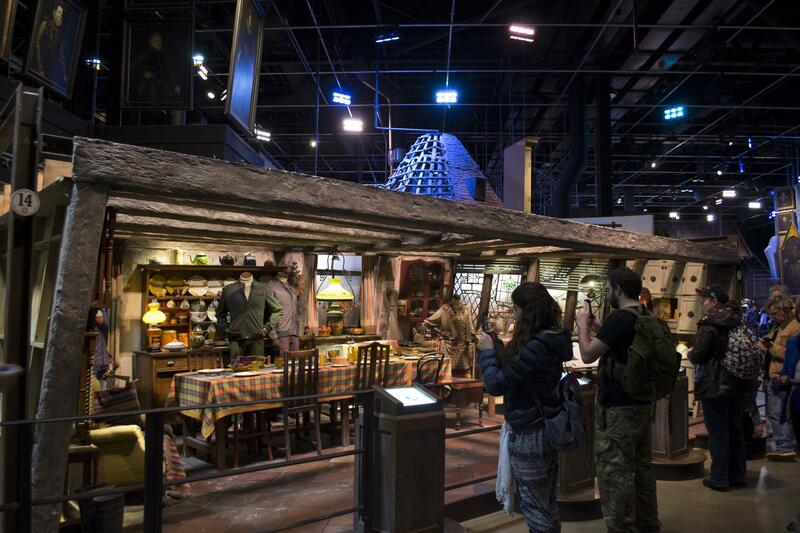 I also got to see how they replicated the outside, while the set was indoors. 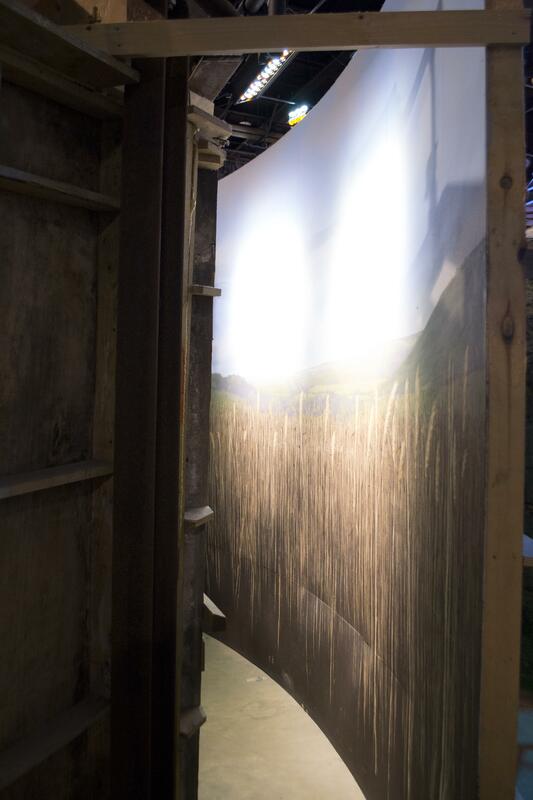 The had a curved board, with an image of fields behind the set, lit in specific places where the windows are. The windows themselves seem to be slightly frosted. 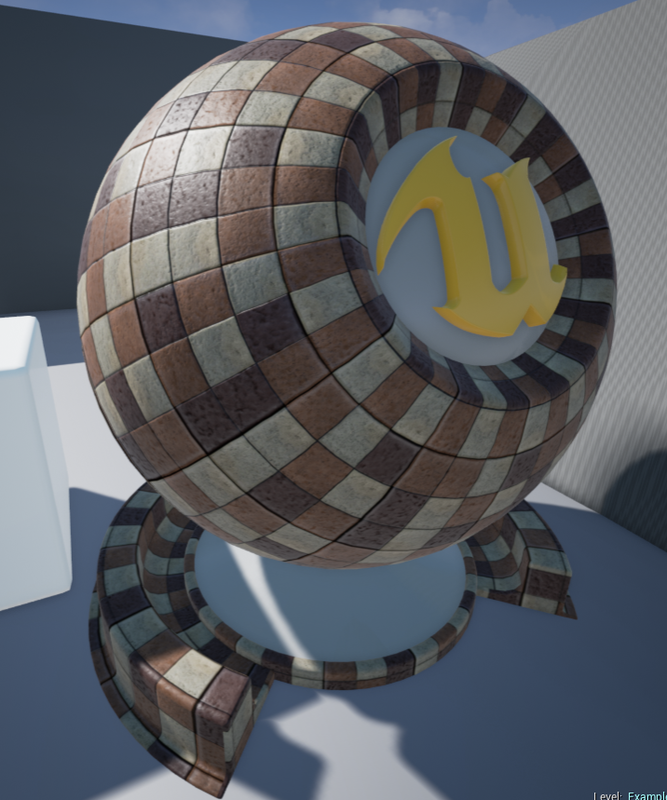 I can replicate this effect easily in Unreal 4. Quick update - Been distracted by other modules at university, but will be updating my progress soon. 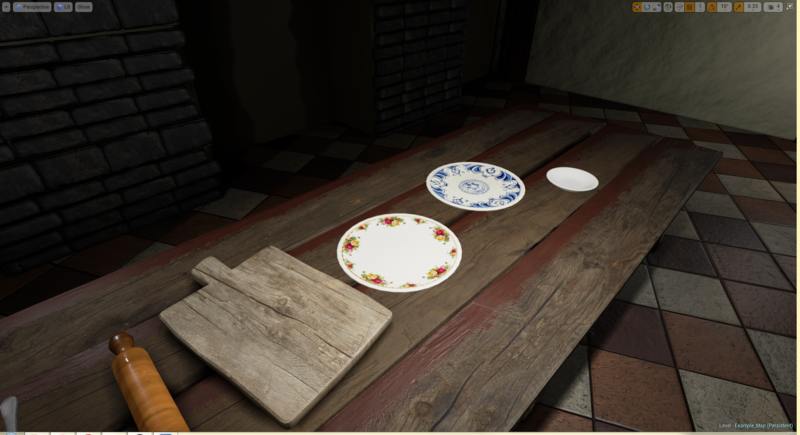 Heres a few minor assets thats in my scene, cutlery and a chopping board c: More to come! These small scale assets also served as further pipeline tests, helping me determine how long smaller assets should take me to produce. 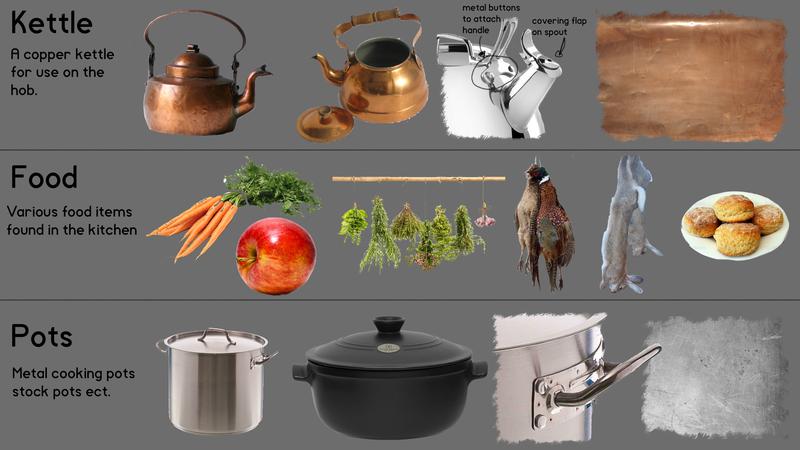 These smaller assets take approximately an hour to complete. 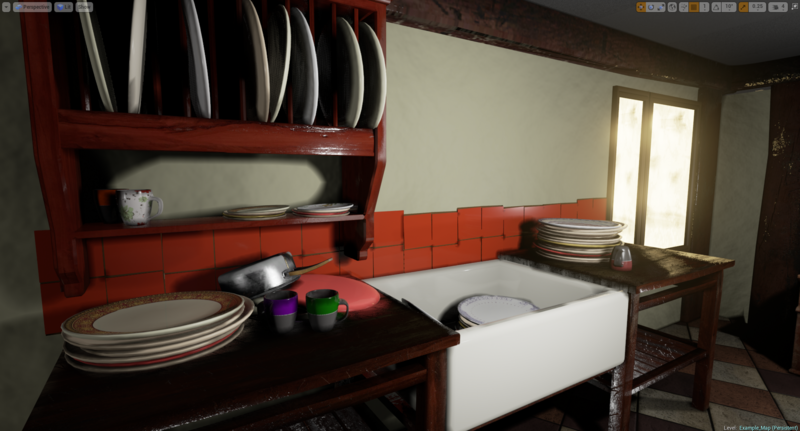 These assets also allowed me to become even more comfortable in the software Quixel and how PBR works, as well as importing them in to UE4. Bang up job Ashlerleee! I have a question concerning your pbr technique. 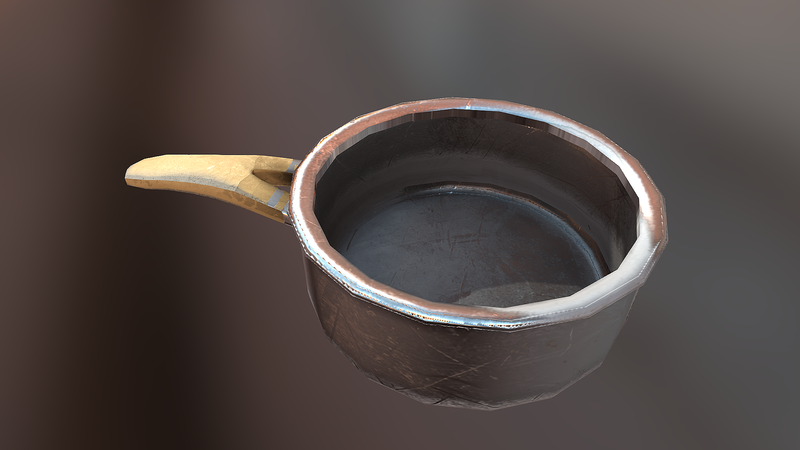 I am just learning pbr myself so everything looks solid. The wood details gave me pause. Did you sculpt the wood details and just use a tanish color for the albedo? 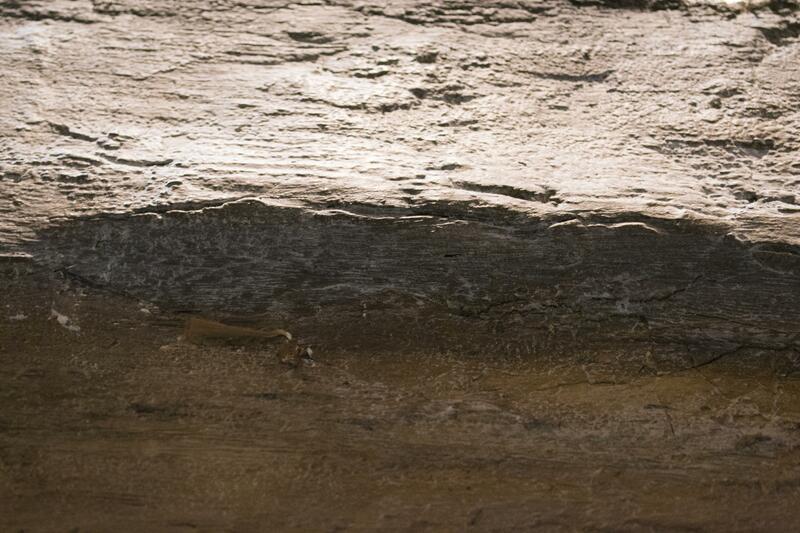 Or did you take out any shadow information from a photo for the albedo thus avoiding the sculpt? My money is on the first but wanted to ask :-D Thanks! 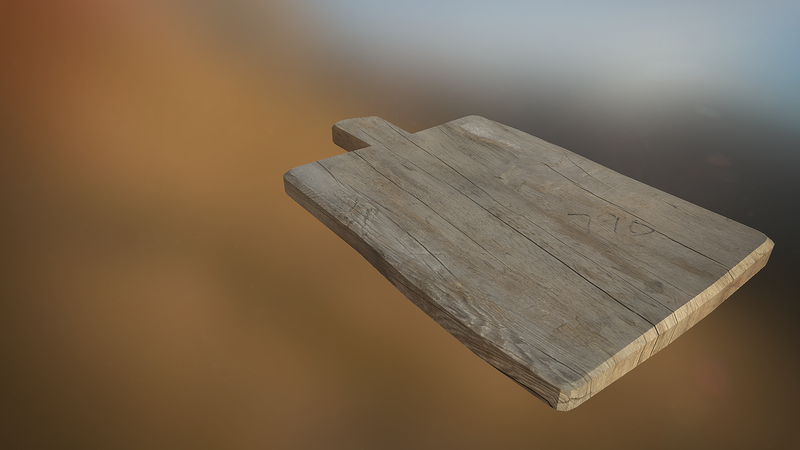 Hia Chase For the chopping board I used the program Quixel, and was able to layer different available textures to create the desired worn wooden effect. I wanted to see how good it would look without any sculpting, and I think it looks quite decent. I have however found a easy way to remove lighting information from a photo for my own custom materials, doesn't work for everything, but for most things its a good start. If you duplicate your photo image, and desaturate that - invert it and set that layer to overlay. 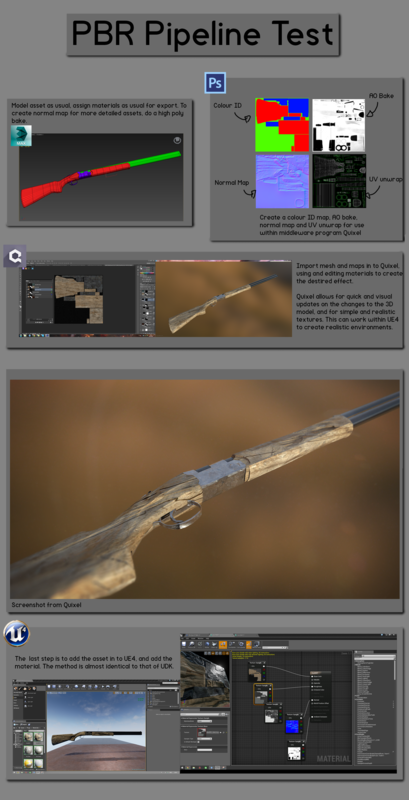 I did a small paper including the theory of PBR and how it works, which helped an awful lot when it came to figuring it out in practice. Thanks for the reply Ashley! Ive only used ndo but havent used ddo. 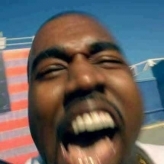 If you didnt use ddo would have gone about it kne if the ways I laid out? That lighting removal technique is something I too saw. Gonna give it a try and see how it turns out. Do you have a pdf to that write up? My God !! this is damn good !! 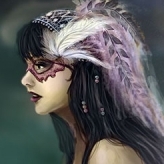 @ Chase - If I hadn't used ddo, I would have removed the lighting from a photo texture to use for an albedo as it is a very small asset within my scene. 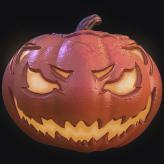 If it was a larger more visible asset I would have sculpted the details in. @Asherleee I have a question, I just discovered a new workflow from you. 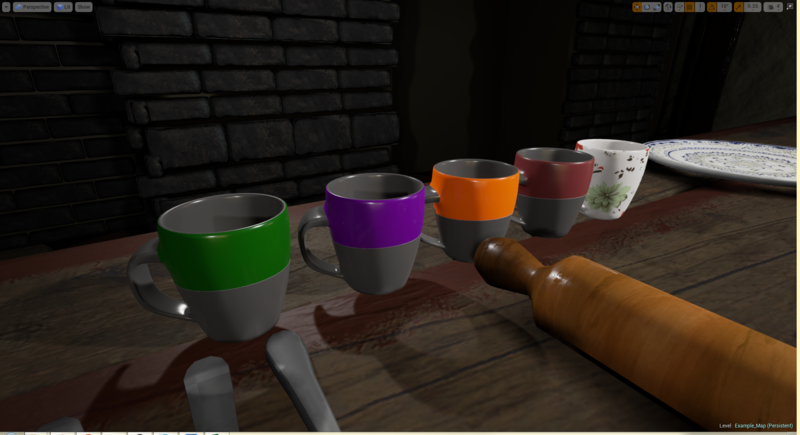 Making Color ID map, so did you use Substance Painter or is Color masking in other programs too ? What program did you use to make albedos ? Haha cool idea! Can't wait to see more. 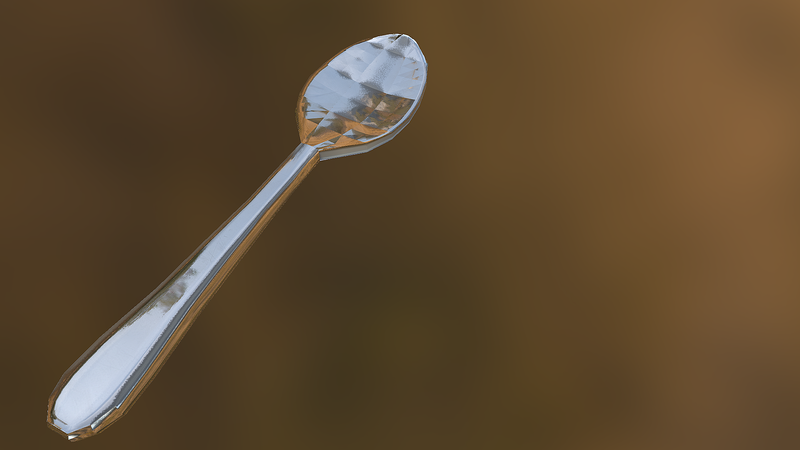 I'm using Quixel, though I keep meaning to have a dabble in Substance - it looks really fun. Thats right, I have some walls. At this point the brick wall is comprised of rows of sets of 4 bricks. In the polish stage I intend to change this to a plane. 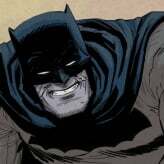 If I don't get chance to do so, I'll make a single, and 2 bricks additional to break up the wall, as everything is too aligned and would make for a very unstable wall. So before I started doing some serious sculpting work, I decided to test the Mudbox pipeline vs Ndo. Testing on a basic asset, I experimented with both high and low poly workflow to determine that for low poly assets, Ndo can be used to high quality, but for high poly large assets, mudbox is the way to go. 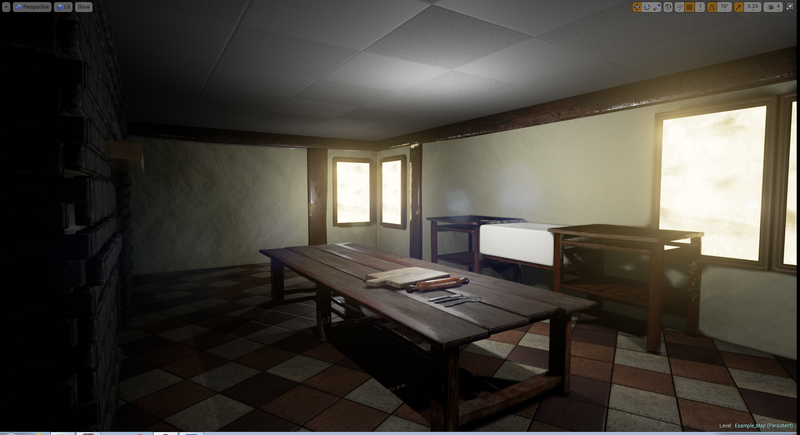 Popped in a roof, and started a initial lighting pass. I also put bloom on the windows to fake an outside. I'm hoping to change this later, but due to time restrictions I'll have to leave it as is for now. 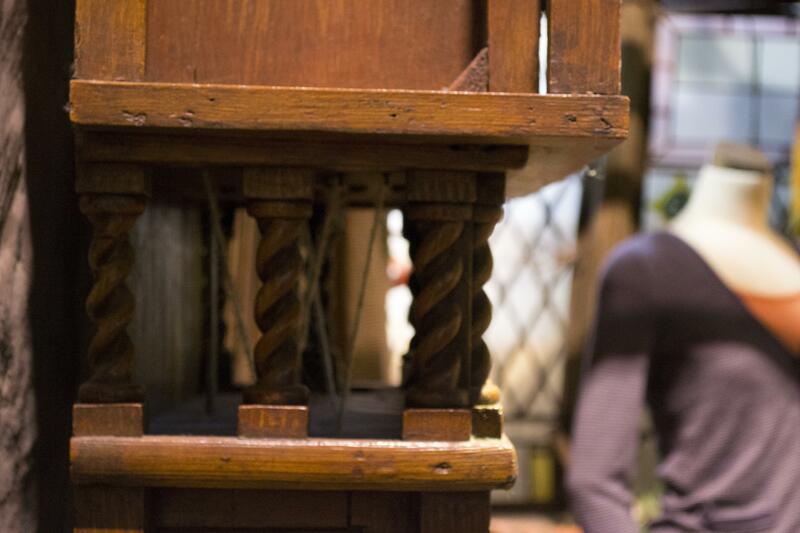 I also intend to polish the table top, as the wear of paint off the wood isn't how it would work in real life. Its also very dull and plastic-y and needs material work to improve it. So far, I like where this is going. 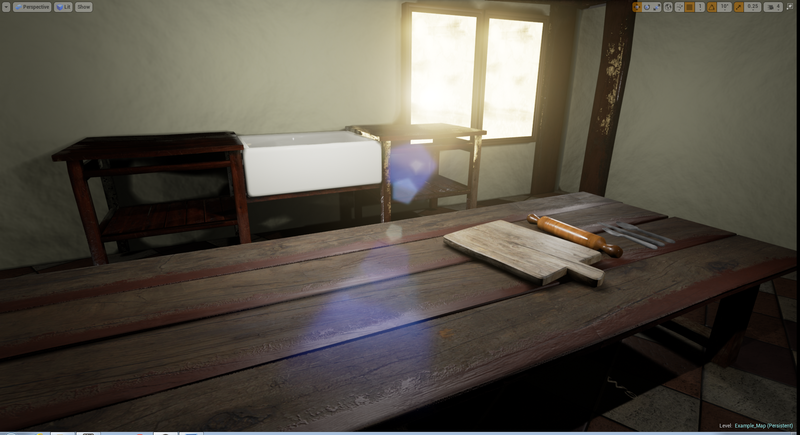 The floor tiling is good, I like the wooden table and kitchen utensils, good lighting and texture work. However, that doesn't mean I don't have a few issues. 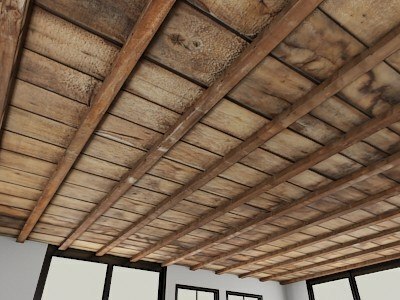 First, I'll address the ceiling, probably the biggest problem with the whole image. It just doesn't work. It feels more fitting to be the roof of an office building that of a kitchen, and it completely upsets the atmosphere and immersion. It uses a palette of light urban grays, while the rest of the set uses browns and whites. 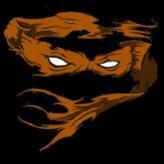 Alternatively, something like this might suit better. I will also address the corner of the room that the camera is facing towards. When have you ever seen two windows next to each other like that in a building before? It just doesn't feel right, and would look better if maybe one of those windows was moved across to another part of the wall, probably to the left in order to create a light balance. And finally, the draws to the left. Something about them just doesn't feel real, and, like the ceiling, they don't match the rest of the scene's color palette. I like how they're presented, with one slid open and others open and closed to certain degrees, but almost any alternative would be far better suited. Overall, I like the concept of what you are trying to do, and there is definitely a theme here. Some of the items in this scene just don't fit the theme, though. I hope you use this criticism to improve your work. 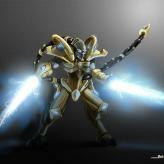 @ Lord Striker - hia. Thanks for the feedback, I'll go through each section. 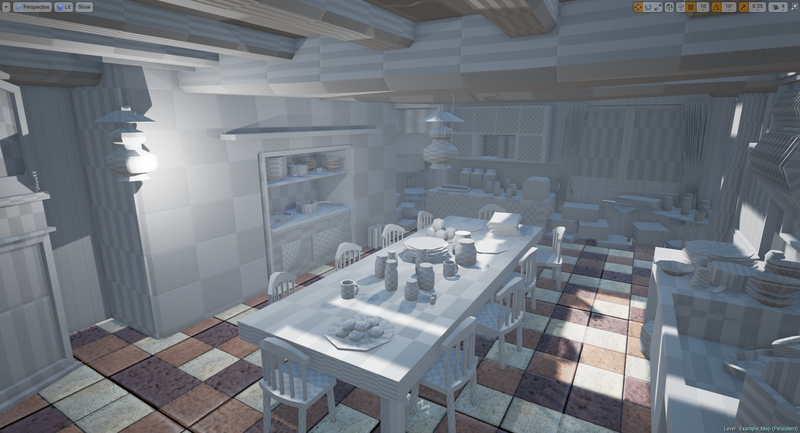 Ceiling - so that's just a cube with no material attached so I could get some initial lighting bakes completed. 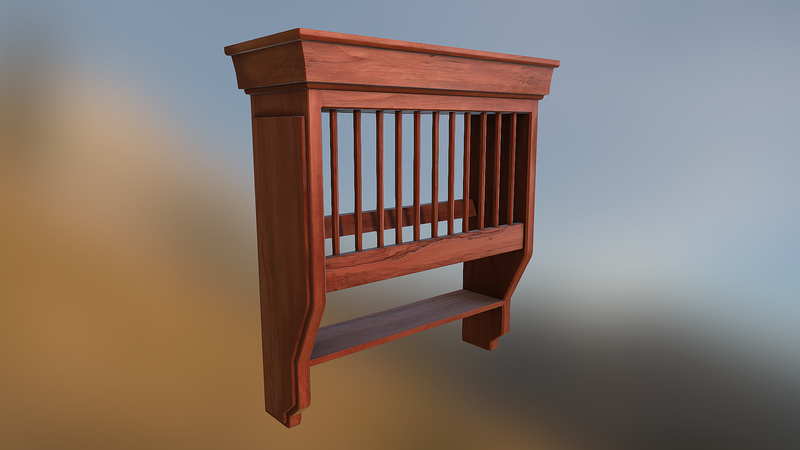 If you look at my blockout you can see some of the intended detail that I will include. 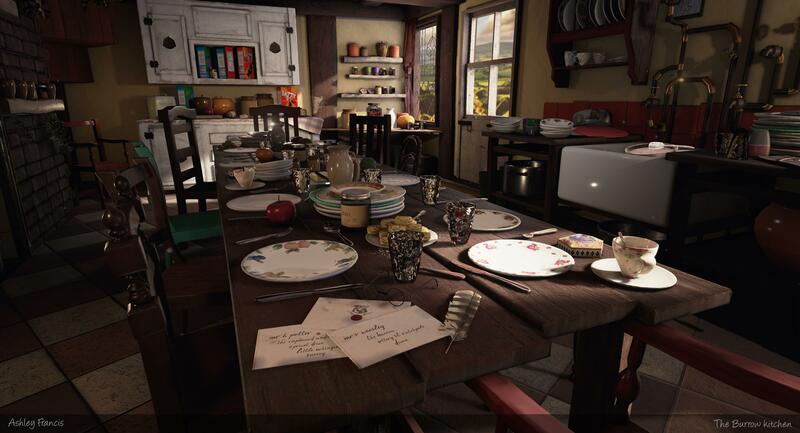 The two windows - so I'm recreating Mrs Weasleys kitchen accurate to The Chamber of secrets. 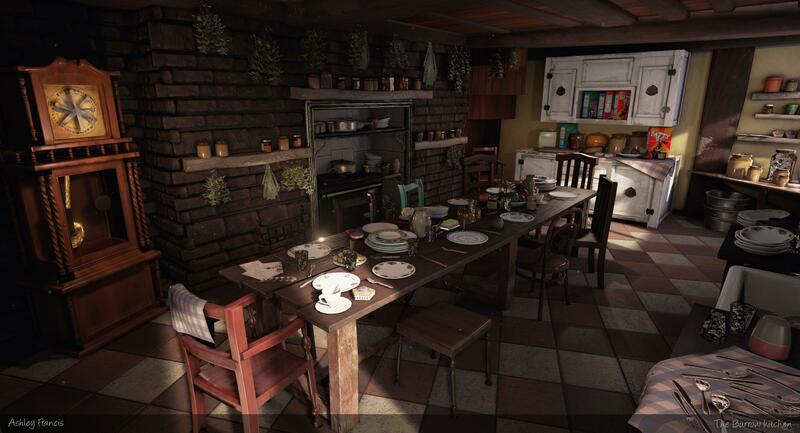 If you go look at the reference images earlier in the blog you can see those two windows side by side. In further films it actually has 3 in a row. 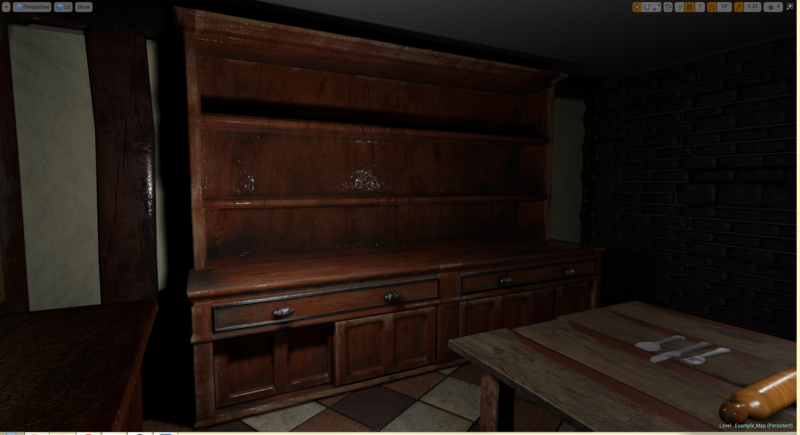 The drawers - I'm not sure what youre looking at for this particular feedback, as I dont have drawers in my scene. Hi all. 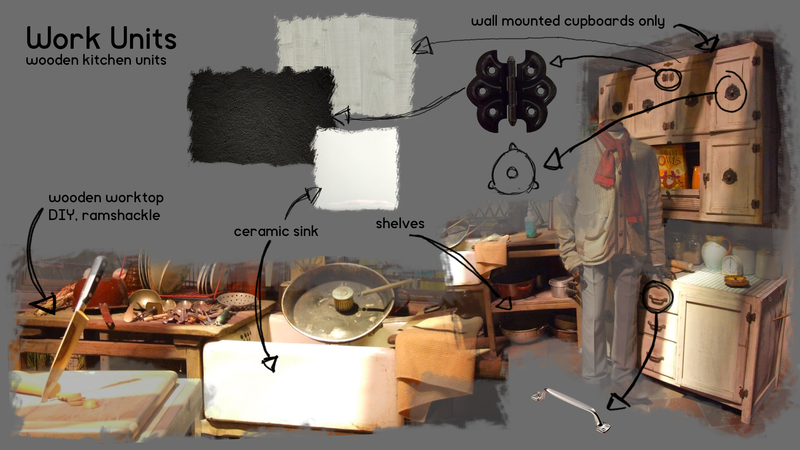 I've done a major asset, the cabinet that will hold odds and sods like plates and cups. 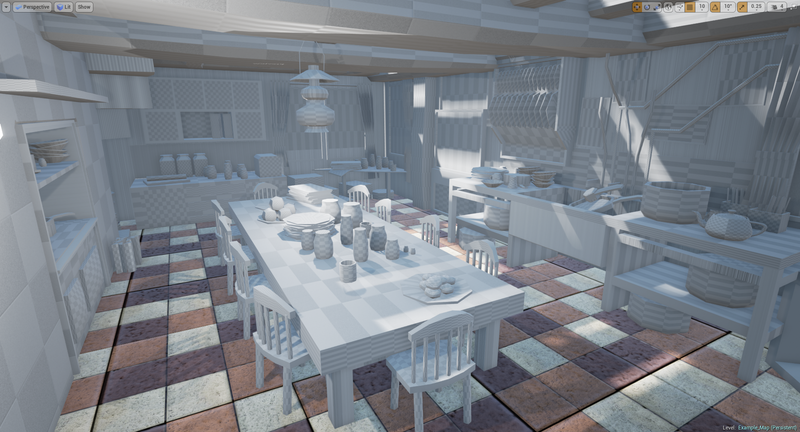 I've also developed a modular plate system, whereby using parameters I can use instanced materials to change the patterns, colour and roughness of each plate easily. Have some plates you lovely lot. 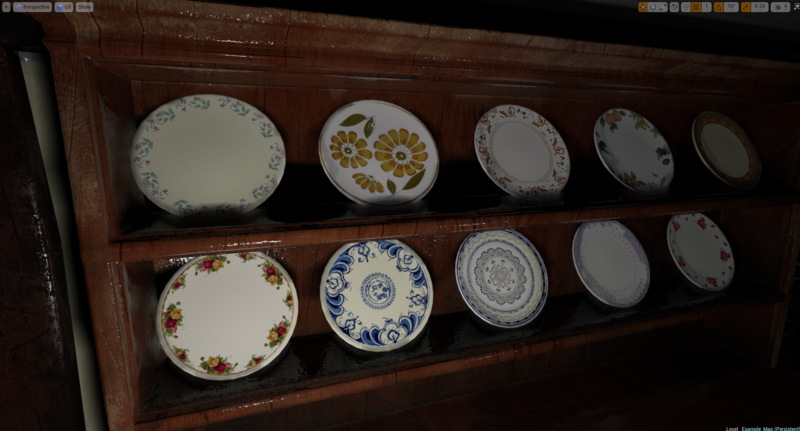 These are my modular plates, where I can swap out the pattern super easy and change their colour super easy. 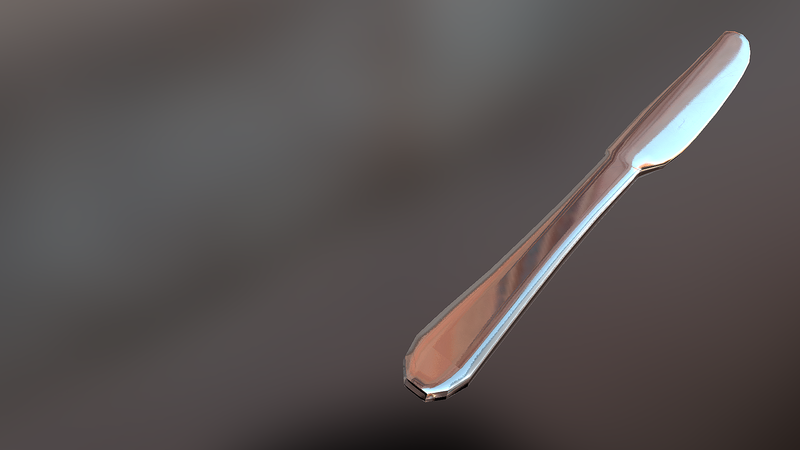 just as a quick note - I am aware that the gloss is ramped way too high, but I'm going to fix that after my final, or near final, lighting pass. I love this project, keep up the good work! Thanks Holly I love it too! 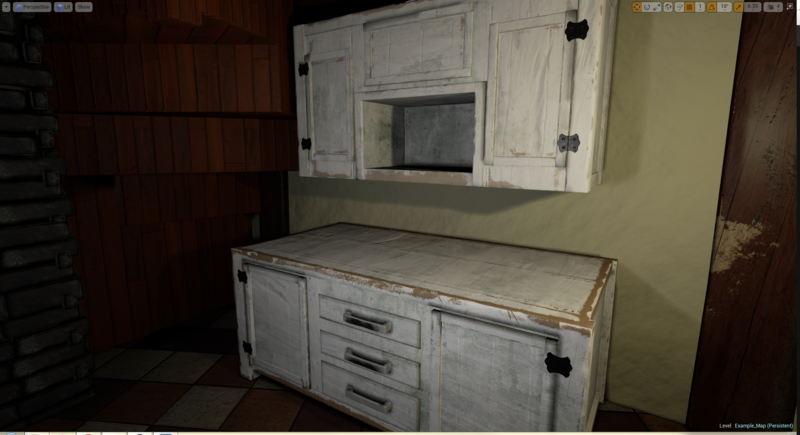 The cabinet looks very glossy, I'd consider adjusting the gloss in DDO so it's not so bright. 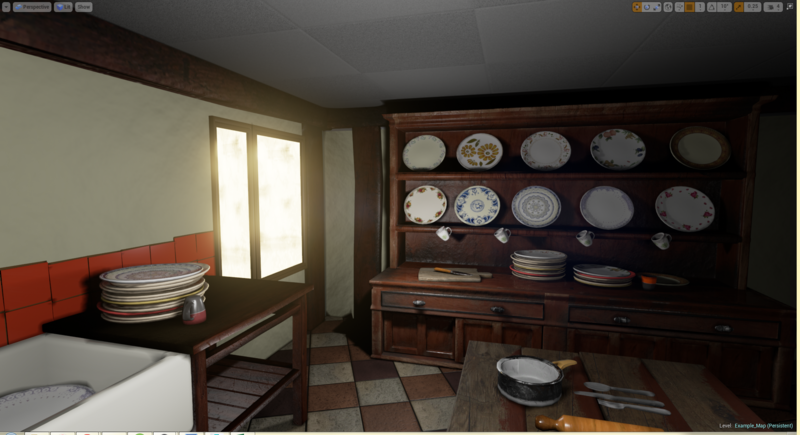 Hia Failhappy, thanks very much I'll be adjusting things like the cabinet once my final lighting pass is done, with it being PBR j dont want to tinker too much yet. 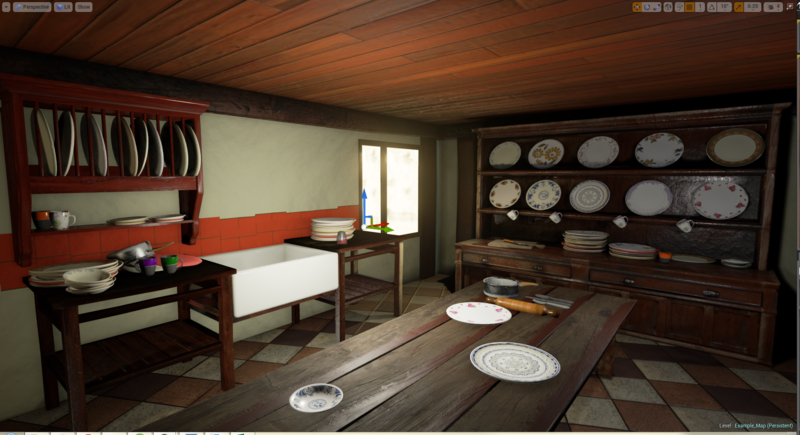 Had quite a productive day today, filling up parts of the scene with plates and other odds and sods. 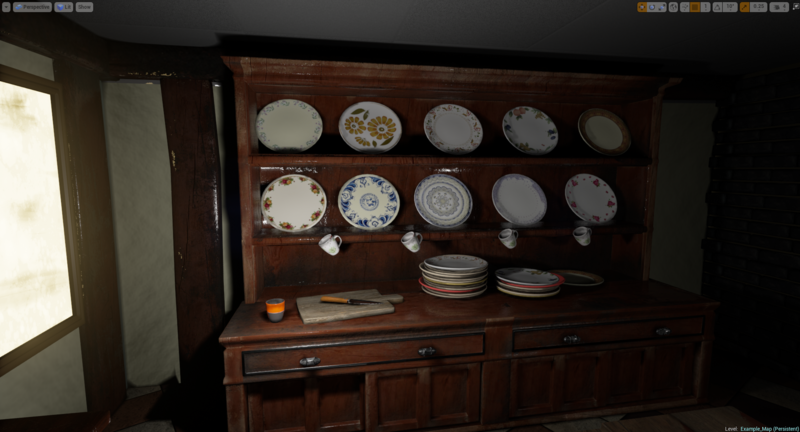 More plates, some mugs, that kinda thing. One half of the scene is looking much more established than the other, so I'm going to have to focus on that empty half now. 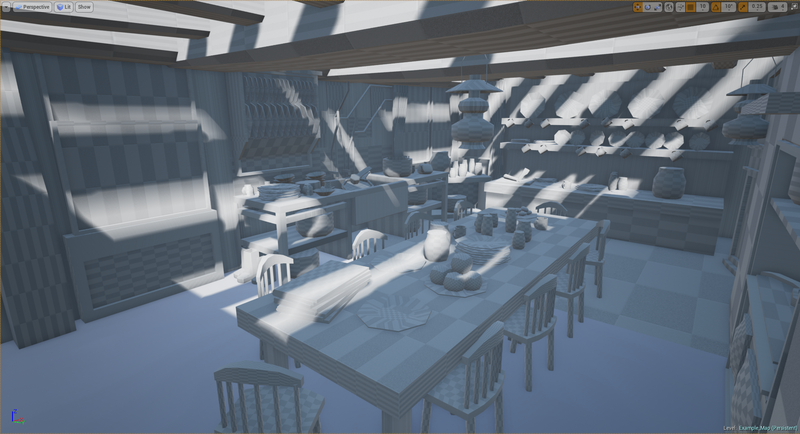 The plan is to contiune with the clutter assets tomorrow, then crack out from more major ones on the week days. 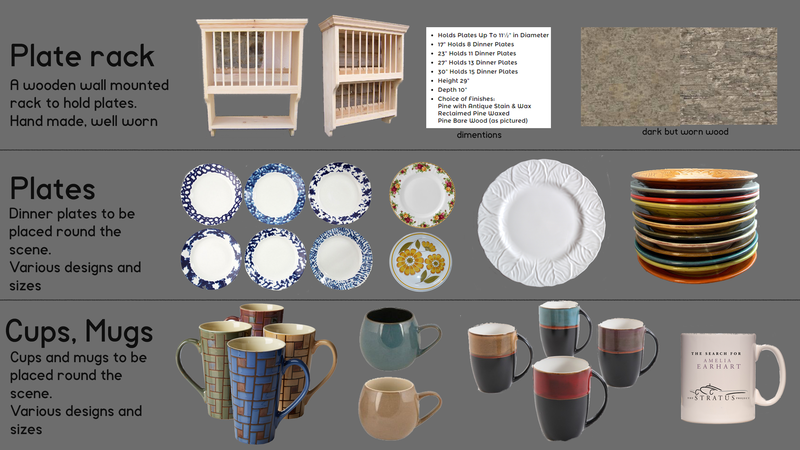 For the mugs, I'm using the same system I did for the plates, which I'll also do on the bowls tomorrow. Those are very modern, mass produced looking cups both in shape and glaze, where everything else has a more worn, hand made and antique quality. 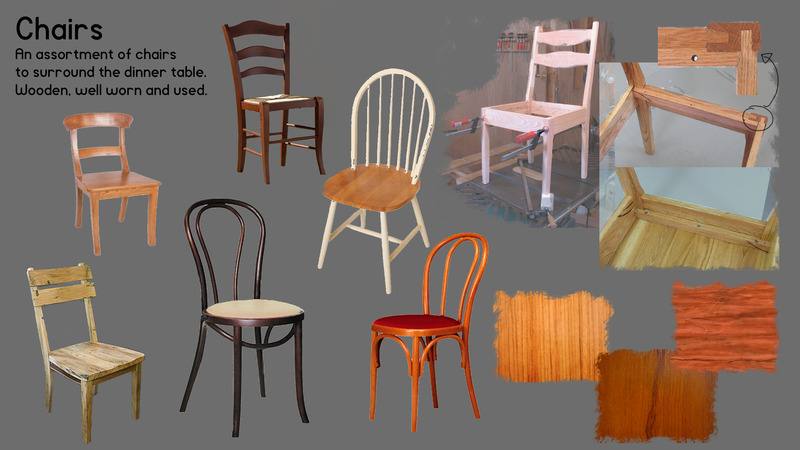 A more hand-thrown look would probably fit your scene quite a bit better. I personally think your wood is a bit to shiny. It looks either wet or fresh painted. @KustomZero - I'm hesitant to start fixing material issues until I get a better lighting pass in there, but the high gloss is certainly a major issue in this scene currently. 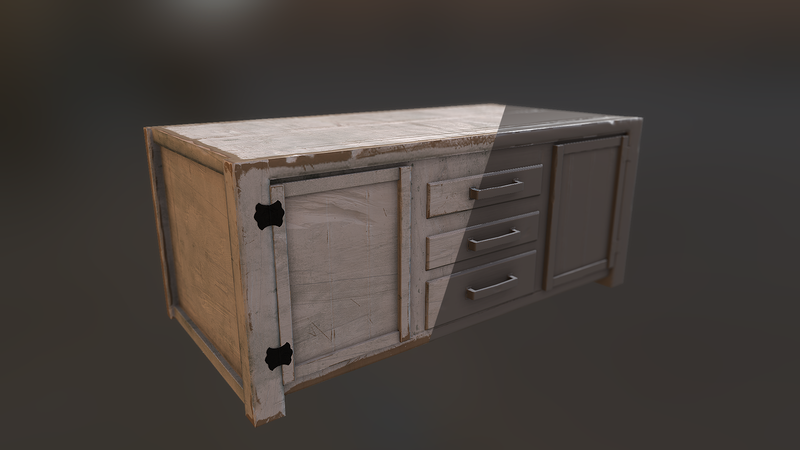 The whole thing about PBR is that the materials should behave correctly with any lighting scenario, adjusting you materials according to a specific light setup might not be the best thing to do. 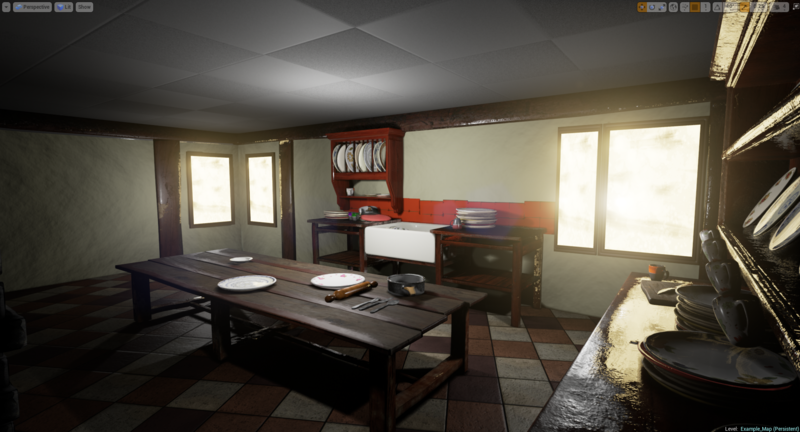 The more assets you create the more difficult/painful it'll be to adjust all the textures. 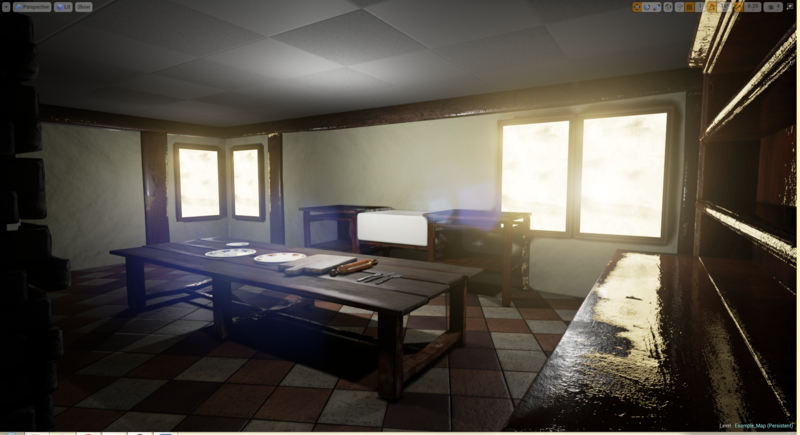 Normally, what you see in the authoring application should reflect what you'll get in UE4, if it's not the case I'd advice you to check the workflow / make sure the textures are imported correctly (sRGB/linear thing for example). 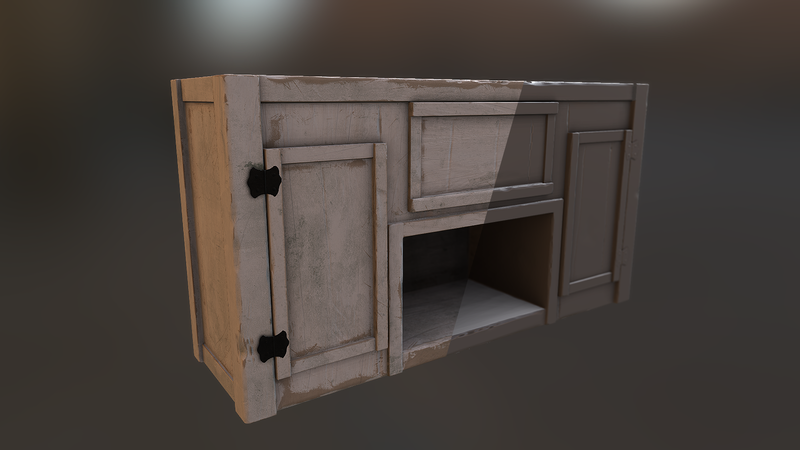 In Quixel they don't seem to be mega glossy, but it seems to be the roughness maps that it exports that is responsible for it. I've unplugged that to see what that looks like, replacing it with some constants. Added a few more assets to start filling in that empty half. WOW, those white cabinets look great. I'm so excited by this project, keep it up! Looking great so far! As everyone else has mentioned, your pre-production is fantastic! 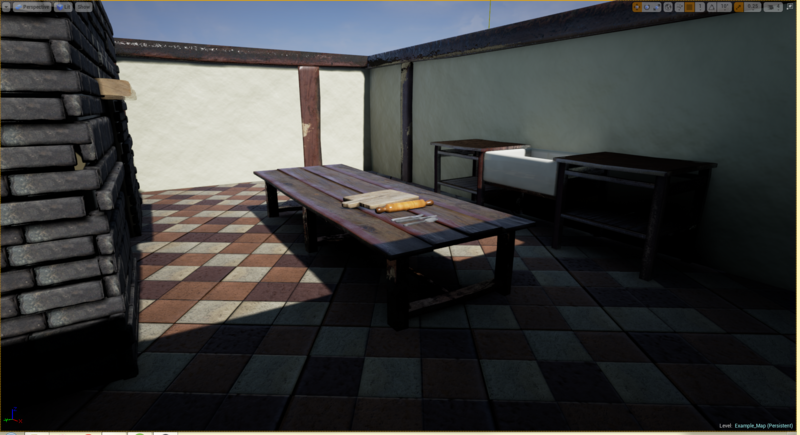 How much of your texturing/material work is straight from Quixel/Ddo and how much of it is from reference/editing? This may just be a first pass, but I'd recommend adding more color variation in the albedo, some of them are looking a little flat.